Abstract: Due to the chemical inertness and the distinct isotopic composition in different reservoirs, noble gas isotopes are playing important role in tracing ore-forming fluid origin, evolution and the process of crust-mantle interaction. Besides, as 4He and 40Ar has the effect of time accumulation, they are often used for dating. In this paper, we briefly reviews the modification of noble gas isotopes in fluid inclusions by post-entrapment processes and matters needing attention in the selection of samples and analytical methods, the progress of the noble gas in tracing ore-forming fluid origin, 40K-40Ar and 40Ar-39Ar dating, as well as (U-Th)/He dating. We conclude that noble gas isotopes in fluid inclusions can be modified by addition of cosmogenic 3He, in situ produced 4He and He loss. Analysis methods should be selected according to the purpose. Noble gas isotopes can be used to trace the origin and evolution of ore-forming fluid, and crust-mantle interaction of different types of deposits. In addition, noble gas isotopes combined with halogens can be used to indicate the origin and evolution of ore-forming fluids and salinity, as well as the mechanism of mineral precipitation. 3He/heat ratio can be used to trace the heat source and its transport mode of fluid. The 40Ar/39Ar progressive crushing and stepwise heating techniques can be used to directly determine the mineralization ages of hydrothermal sulfide deposits. 40K-40Ar and/or 40Ar-39Ar dating of supergene K-bearing minerals and (U-Th)/He dating of iron oxides can be used to determine the chronology of deposits and related oxidation zone. Based on the different close temperature of minerals, 40K-40Ar and/or 40Ar-39Ar dating of K-bearing minerals and (U-Th)/He dating of zircon, apatite and iron oxides provide a large amount of meaningful information for history of uplift and exhumation after deposit formation, and paleoclimate evolution. Aciego SM, DePaolo DJ, Kennedy BM, Lamb MP, Sims KWW and Dietrich WE. 2007. Combining cosmogenic dating with U-Th/He eruption ages using olivine in basalt. Earth and Planetary Science Letters, 25(3-4): 288-302. Bähr R, Lippolt HJ and Wernicke RS. 1994. Temperature-induced 4He degassing of specularite and botryoidal hematite:A 4He retentivity study. Journal of Geophysical Research, 99(89): 17695-17707. Cai MH, Wang XB, Nagao K, Peng ZA, Guo TF, Liu H and Tan ZM. 2012. 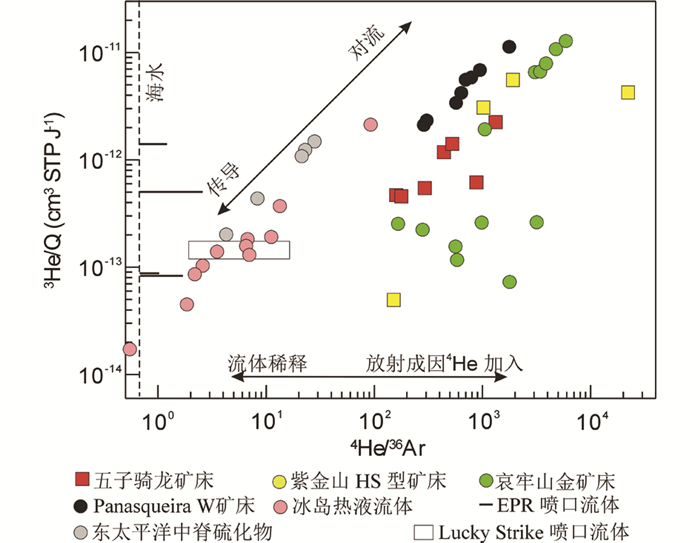 Noble gas isotopic characteristics of Hehuaping tin-polymetallic deposit, southern Hunan Province. Mineral Deposits, 31(6): 1163-1170. Cai MH, Peng ZA, Nagao K, Wang XB, Guo TF and Liu H. 2013. Isotopic characteristics of noble gases of the Fuchuan-Hezhou-Zhongshan W-Sn-polymetallic ore concentration area in northeastern Guangxi and their geological significance. Acta Geoscientica Sinica, 34(3): 287-294. Chen J, Lu JJ, Chen WF, Wang RC, Ma DS, Zhu JC, Zhang WL and Ji JF. 2008. W-Sn-Nb-Ta-bearing granites in the Nanling Range and their relationship to metallogengesis. Geological Journal of China Universities, 14(4): 459-473. Chen W and Zhang Y. 2010. (U-Th)/He dating laboratory was built in the China Geological Survey system. Geology in China, 37(3): 840. Chen X, Su WC and Huang Y. 2016. He and Ar isotope Geochemistry of ore-forming fluids for the Qinglong Sb deposit in Guizhou Province, China. Acta Petrologica Sinica, 32(11): 3312-3320. Chen ZB. 1985. Some basic metallogenetic aspects on Phanerozoic vein-type uranium deposits. Uranium Geology, 1(1): 1-15. Chukhrov FV, Yermilova LP and Shanin LL. 1969. Age of alunite from certain deposits. Trans. Acad. Sci. USSR Dokl., Earth-Sci. Sect., 185: 49-51. Fan CY, Zhu BQ, Pu ZP, Zhang QF and Dai GY. 1986. Investigation on pyrite 39Ar/40Ar dating. Third Chinese Conference on Isotope Geochemistry: 249-250. Hart CJR, Goldfarb RJ, Qiu YM, Snee L., Miller LD and Miller ML. 2002. Gold deposits of the northern margin of the North China Craton:Multiple late Paleozoic-Mesozoic mineralizing events. Mineralium Deposita, 37(3-4): 326-351. He W, Li DM, Zheng DW, Wan JL and Xu YX. 2009. K-Ar dating of Jarosite in eastern Tianshan and its environmental significances. Seismology and Geology, 31(3): 415-423. Hu RG, Wang M, Wijbrans JR, Brouwer FM and Qiu HN. 2013. 40Ar/39Ar geochronology of amphibole from the amphibolite rocks, Xitieshan terrane, North Qaidam UHP metamorphic belt, western China. Acta Petrologica Sinica, 29(9): 3031-3038. Hu RZ, Bi XW, Turner G and Burnard PG. 1999. 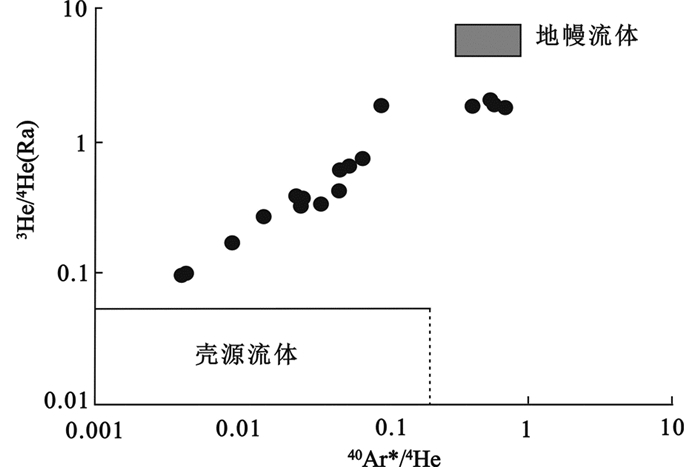 Helium and argon isotope geochemistry of the ore-forming fluid for gold deposits in Ailaoshan metallogenic belt. Science in China (Series D), 29(4): 321-330. Hurley PM and Goodman C. 1943. Helium age measurement.Ⅰ. Preliminary magnetite index. GSA Bulletin, 54(3): 305-324. Irwin JJ and Roedder E. 1995. Diverse origins of fluid in magmatic inclusions at Bingham (Utah, USA), Butte (Montana, USA), St. Austell (Cornwall, UK), and Ascension Island (mid-Atlantic, UK), indicated by laser microprobe analysis of Cl, K, Br, I, Ba + Te, U, Ar, Kr, and Xe. Geochimica et Cosmochimica Acta, 59(2): 295-312. Jiang SY, Dai BZ, Jiang YH, Zhao HX and Hou ML. 2009. Jiaodong and Xiaoqinling:Two orogenic gold provinces formed in different tectonic settings. Acta Petrologica Sinica, 25(11): 2727-2738. Jiang YD, Qiu HN, Yun JB and Wang Q. 2007. Sphalerite 40Ar/39Ar dating by crushing in vacuum and stepwise heating on crushed powders. Geochimica, 36(5): 457-466. Li JW, Yan DR, Vasconcelos PM, Duzgoren-Aydin NS, Hu MA and Chen MH. 2004. 40Ar/39Ar geochronology of supergene K-bearing manganese oxides and its paleoclimatic implications. Earth Science Frontiers, 11(2): 589-598. Li XH, Chu FY, Lei JJ, Zhao HQ and Yu X. 2014. Discussion on sources of metallogenic materials of hydrothermal sulfide from Southwest Indian Ridge:Isotope evidences. Journal of Earth Sciences and Environment, 36(1): 193-200. Lippolt HJ, Wernicke RS and Boschmann W. 1993. 4He diffusion in specular hematite. Physics and Chemistry of Minerals, 20(6): 415-418. Lippolt HJ, Brander T and Mankopf NR. 1998. An attempt to determine formation ages of goethites and limonites by (U+Th)-4He dating. Neues Jahrbuch fur Mineralogie Monatshefte, 11: 505-528. Liu J, Wu G, Qiu HN, Gao DZ and Yang XS. 2013. 40Ar/39Ar dating of gold-bearing quartz vein from the Shabaosi gold deposit at the northern end of the Great Xing'an Range and its tectonic significance. Acta Geologica Sinica, 87(10): 1570-1579. Lu HZ. 1986. 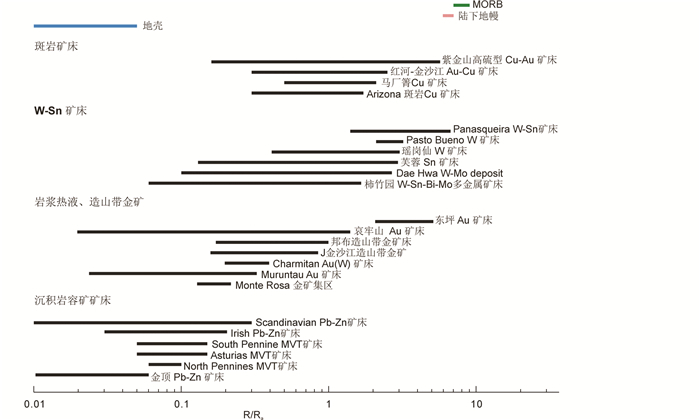 Origin of Tungsten Mineral Deposit in South China. Chongqing: Publishing House of Chongqing: 1-232. Mao JW, Li YQ, Goldfarb R, He Y and Zaw K. 2013. Fluid Inclusion and noble gas studies of the Dongping gold deposit, Hebei Province, China:A mantle connection for mineralization?. Economic Geology, 98(3): 517-534. Qiu HN and Dai TM. 1989. 40Ar/39Ar technique for dating the fluid inclusions of quartz from a hydrothermal deposit. Chinese Science Bulletine, 34(22): 1887-1890. Qiu HN, Dai TM and Pu ZP. 1994. Dating mineralization of Lushui tin-tungsten deposit, Western Yunnan, using 40Ar-39Ar age spectrum technique. Geochimica, 23(Suppl. ): 93-102. Qiu HN, Zhu BQ and Sun DZ. 2000. 40Ar-39Ar dating techniques for a hydrothermal siliceous breccia sample from the Luoxue mine, Dongchuan copper deposits, Yuunan, by crushing in vacuum and then by stepped heating on its powders. Geochimica, 29(1): 21-27. Qiu HN, Wijbrans JR, Li XH, Zhu BQ, Zhu CL and Zeng BC. 2001. 40Ar-39Ar dating for the mineralization ages of the Dongchuan-type layered copper deposits, Yunnan. Bulletin of Mineralogy, Petrology and Geochemistry, 20(4): 358-359. Qiu HN, Wijbrans JR, Shi HS and Li FL. 2004. The 450Ma message and excess 40Ar within garnet from the Bixiling eclogite in Dabie Shan:Interpreted from the 40Ar-39Ar dating results by crushing. Geochimica, 33(4): 325-333. Qiu HN and Wijbrans JR. 2006. Amphibolite-facies overprinting and a hydrothermal activity in southern Dabie terrane:Insight from Ar-Ar dating of Zhujiachong eclogite and metamorphic amphibole vein. Geochimica, 35(5): 517-524. Qiu HN, Xu YG, Yun JB, Wang Q and Zhao LH. 2009. 40Ar-39Ar Ultra-Violet Laser Ablation Microprobe (UVLAMP):Timing of amphibolite-facies retrograde metamorphism of Zhujiachong UHP eclogite. Acta Geologica Sinica, 83(8): 1118-1124. Sánchez V, Stuart FM, Martín-Crespo T, Vindel E, Corbella M and Cardellach E. 2010. Helium isotopic ratios in fluid inclusions from fluorite-rich Mississippi Valley-Type district of Asturias, northern Spain. Geochemical Journal, 44(6): E1-E4. Shan Q, Zeng QS, Li JK, Lu HZ, Hou MZ, Yu XY and Wu CJ. 2014. Diagenetic and metallogenic sources of Furong Tin deposit, Qitianling:Constraints from Lu-Hf for zircon and He-Ar isotope for fluid inclusions. Acta Geologica Sinica, 88(4): 704-715. Strutt RJ. 1908. On the accumulation of helium in geological time. Proceedings of the Royal Society of London. Series A, Containing Papers of a Mathematical and Physical Character, 81(547): 272-277. Strutt RJ. 1910. The accumulation of helium in geological time. Proceedings of the Royal Society of London. Series A, Containing Papers of a Mathematical and Physical Character, 83(562): 289-301. Sun JB, Chen W, Yu S, Shen Z and Tian YT. 2017. Study on zircon (U-Th)/He dating technique. Acta Petrologica Sinica, 33(6): 1947-1956. Turner G, Burnard P, Ford JL, Gilmour JD, Lyon IC and Stuart FM. 1993. Tracing fluid sources and interactions. Philosophical Transactions:Physical Sciences and Engineering, 344(1670): 127-140. Wang BD, Niu SY, Sun AQ and Li HY. 2003. Helium, argon and lead isotopic compositions in gold deposits and the source of ore-forming materials in North Hebei Province. Geochimica, 32(2): 181-187. Wang J and Ma LB. 2014. 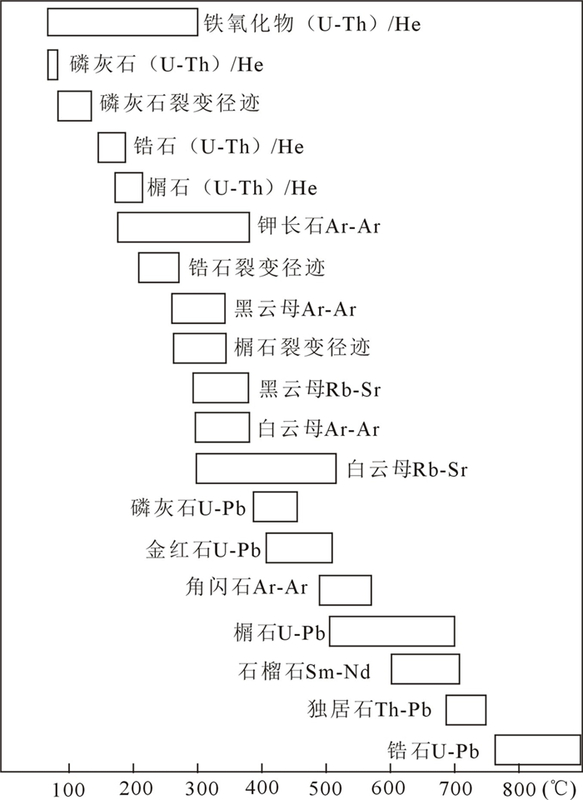 U-Th/He dating method of single mineral grain of apatite and zircon from Wuxi Institute of Petroleum Geology, SINOPEC. Petroleum Geology & Experiment, 36(3): 254. Wang M, Bai XJ, Hu RG, Cheng SB, Pu ZP and Qiu HN. 2015. Direct dating of cassiterite in Xitian tungsten-tin polymetallic deposit, South-East Hunan, by 40Ar/39Ar progressive crushing. Geotectonica et Metallogenia, 39(6): 1049-1060. Wang M, Bai XJ, Yun JB, Zhao LH, Li YL, Wang ZY, Pu ZP and Qiu HN. 2016. 40Ar/39Ar dating of mineralization of Shizhuyuan polymetallic deposit. Geochimica, 45(1): 41-51. Wang Y, Zheng DW, Wu Y, Li YJ and Wang YZ. 2017. Measurement procedure of single-grain apatite (U-Th)/He dating and its validation by Durango apatite standard. Seismology and Geology, 39(6): 1143-1157. Wasserburg GJ and Hayden RJ. 1955. Age of meteorites by the A40-K40 method. Physical Review, 97(1): 86-87. Wei WF, Hu RZ, Bi XW, Jiang GH, Yan B, Yin RS and Yang JH. 2018. Mantle-derived and crustal He and Ar in the ore-forming fluids of the Xihuashan granite-associated tungsten ore deposit, South China. Ore Geology Reviews, under review. Weisberg WR, Metcalf JR and Flowers RM. 2018. Distinguishing slow cooling versus multiphase cooling and heating in zircon and apatite (U-Th)/He datasets:The case of the McClure Mountain syenite standard. Chemical Geology, 458: 90-99. Wu L, Wang F, Shan JN, Zhang WB, Shi WB and Feng HL. 2016. (U-Th)/He dating of international standard Durango apatite. Acta Petrologica Sinica, 32(6): 1891-1900. Wu LY, Sturt FM, Nicola LD, Heizler M, Benvenuti M and Hu RZ. 2018b. Multi-aliquot method for determining (U+Th)/He ages of hydrothermal hematite:Returning to Elba. Chemical Geology. Xie GQ, Mao JW, Li W, Zhu QQ, Liu HB, Jia GH, Li YH, Li JJ and Zhang J. 2016. 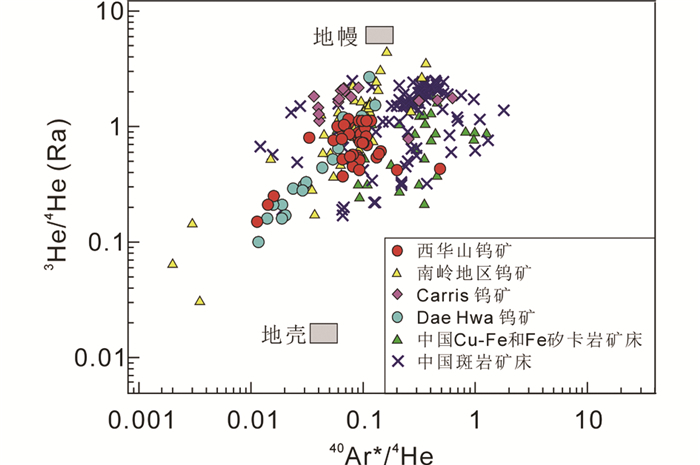 Different proportion of mantle-derived noble gases in the Cu-Fe and Fe skarn deposits:He-Ar isotopic constraint in the Edong district, eastern China. Ore Geology Reviews, 72(1): 343-354. Xu YX, Qin KZ, Ding KS, Li JX, Miao Y, Fang TH, Xu XW, Li DM and Luo XQ. 2008. Geochronology evidence of Mesozoic metallogenesis and Cenozoic oxidation at Hongshan HS-epithermal Cu-Au deposit, Kalatage region, eastern Tianshan, and its tectonic and paleoclimatic significances. Acta Petrologica Sinica, 24(10): 2371-2383. Yang J, Zheng DW and Wu Y. 2013. 40Ar/39Ar geochronology of supergene alunite-group minerals. Seismology and Geology, 35(1): 177-187. Yang J, Zheng DW, Chen W, Wu Y, Li J and Zhang Y. 2015. The methodology for 40Ar/39Ar geochronology of supergene jarosite:From sampling to isotopic analysis. Geological Bulletin of China, 34(2-3): 579-586. Ye XR, Wu MB, Tao MX and Sun ML. 2003. Laser microprobe analyses of noble gas isotopes in minerals:The technology and application. Earth Science Frontiers, 10(2): 293-300. Yu S, Chen W, Zhang B, Sun JB, Li C, Yuan X, Shen Z, Yang L and Ma X. 2016. Mesozoic and Cenozoic uplift and exhumation history of the Kekesu section in the center Tianshan:Constrained from (U-Th)/He thermochronometry. Chinese Journal of Geophysics, 59(8): 2922-2936. Zhai MG, Fan HR, Yang JH and Miao LC. 2004. Large-scale cluster of gold deposits in East Shandong:Anorogenic metallogenesis. Earth Science Frontiers, 11(1): 85-98. Zhang LC, Shen YC, Li HM, Zeng QD and Liu TB. 2002. Helium and argon isotopic compositions of fluid inclusions and tracing to the source of ore-forming fluids for Jiaodong gold deposits. Acta Petrologica Sinica, 18(4): 559-565. Zhang Y and Chen W. 2011. Study on the 4He content measurement. Geological Review, 57(2): 300-304. Zhang Y, Chen W and Hu M. 2011. Determination of 238U, 232Th and 147Sm isotopes in apatites by Inductively Coupled Plasma-Mass Spectrometry with non-spike method. Rock and Mineral Analysis, 30(6): 727-731. 白秀娟, 王敏, 卢克豪, 方金龙, 蒲志平, 邱华宁. 2011. 锡石40Ar/39Ar法直接定年探讨. 科学通报, 56(23): 1899-1904. 蔡明海, 彭振安, 长尾敬介, 王显彬, 郭腾飞, 刘虎. 2013. 广西富贺钟钨锡多金属矿集区稀有气体同位素特征及其地质意义. 地球学报, 34(3): 287-294. 陈娴, 苏文超, 黄勇. 2016. 贵州晴隆锑矿床成矿流体He-Ar同位素地球化学. 岩石学报, 32(11): 3312-3320. 陈肇博. 1985. 显生宙脉型铀矿床成矿理论的几个基本问题. 铀矿地质, 1(1): 1-15. 范才云, 朱炳泉, 浦志平, 张前峰, 戴桂英. 1986. 黄铁矿的40Ar/39Ar年代学研究. 第三届全国同位素地球化学学术讨论会论文(摘要)汇编: 249-250. 胡荣国, 王敏, Wijbrans JR, Brouwer FM.邱华宁. 2013. 柴北缘锡铁山榴辉岩退变质成因角闪石40Ar/39Ar年代学研究. 岩石学报, 29(9): 3031-3038. 胡瑞忠, 毕献武, Turner G, Burnard PG. 1999. 哀牢山金矿带金成矿流体He和Ar同位素地球化学. 中国科学(D辑), 29(4): 321-330. 蒋少勇, 戴宝章, 姜耀辉, 赵海香, 侯明兰. 2009. 胶东和小秦岭:两类不同构造环境中的造山型金矿省. 岩石学报, 25(11): 2727-2738. 李小虎, 初凤友, 雷吉江, 赵宏樵, 余星. 2014. 西南印度洋中脊热液硫化物成矿物质来源探讨:同位素证据. 地球科学与环境学报, 36(1): 193-200. 刘军, 武广, 邱华宁, 高德柱, 杨鑫生. 2013. 大兴安岭北部砂宝斯金矿床含金石英脉40Ar/39Ar年龄及其构造意义. 地质学报, 87(10): 1570-1579. 卢焕章. 1986. 华南钨矿成因. 重庆: 重庆出版社: 1-232. 邱华宁, 戴橦谟, 蒲志平. 1994. 滇西泸水钨锡矿床40Ar-39Ar法成矿年龄研究. 地球化学, 23(增刊): 93-102. 单强, 曾乔松, 李建康, 卢焕章, 侯茂洲, 于学元, 吴传军. 2014. 骑田岭芙蓉锡矿的成岩和成矿物质来源:锆石Lu-Hf同位素和矿物包裹体He-Ar同位素证据. 地质学报, 88(4): 704-715. 孙敬博, 陈文, 喻顺, 沈泽, 田云涛. 2017. 锆石(U-Th)/He定年技术研究. 岩石学报, 33(6): 1947-1956. 王杰, 马亮帮. 2014. 中国石化无锡石油地质研究所实验地质技术之单矿物颗粒磷灰石、锆石U-Th/He定年分析技术. 石油实验地质, 36(3): 254. 王敏, 白秀娟, 胡荣国, 程顺波, 蒲志平, 邱华宁. 2015. 湘东南锡田钨锡多金属矿床锡石40Ar/39Ar直接定年. 大地构造与成矿学, 39(6): 1049-1060. 吴林, 王非, 单竞男, 张炜斌, 师文贝, 冯慧乐. 2016. 国际标样Durango磷灰石(U-Th)/He年龄测定. 岩石学报, 32(6): 1891-1900. 许英霞, 秦克章, 丁奎首, 李金祥, 缪宇, 方同辉, 徐兴旺, 李大明, 罗修泉. 2008. 东天山红山高硫型浅成低温铜-金矿床:中生代成矿与新生代氧化的K-Ar、Ar-Ar年代学证据及其古构造和古气候意义. 岩石学报, 24(10): 2371-2383. 杨静, 郑德文, 陈文, 武颖, 李洁, 张彦. 2015. 风化矿物黄钾铁矾40Ar/39Ar测年的基本方法——从样品采集到年龄测试. 地质通报, 34(2-3): 579-586. 喻顺, 陈文, 张斌, 孙敬博, 李超, 袁霞, 沈泽, 杨莉, 马勋. 2016. 中天山科克苏河地区隆升剥蚀历史——来自(U-Th)/He年龄的制约. 地球物理学报, 59(8): 2922-2936. 张连昌, 沈远超, 李厚民, 曾庆栋, 李光明, 刘铁兵. 2002. 胶东地区金矿床流体包裹体的He、Ar同位素组成及成矿流体来源示踪. 岩石学报, 18(4): 559-565. 张彦, 陈文. 2011. 4He同位素含量测试技术研究. 地质论评, 57(2): 300-304.